The start of the Charm City Cyclocross Masters 3/4 race on Sunday, September 19, was chock full of controversy and intrigue. Helmet cams were confiscated, disqualifications for false starts were threatened and people were doing all kinds of crazy things up the road. Not having the forward-facing helmet-cam, it’s hard to say exactly how the race developed. But the rear-facing camera remained in place (for about thirty seconds) to capture the race as it unfolded. All over the road. 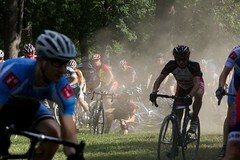 They say the start is the most important part of a cyclocross race. The conventional wisdom is that getting up front and in a good position will not necessarily win you the race but it should keep you clear of the bottlenecks and early race crashes. The conventional wisdom is not always right. Full Video of Saturday’s race still to come. Thanks for watching. You were doing pretty good until that little mishap! Pretty good until that little mishap…ufortunately it was on the first turn! I love how I can see the Van Dessel badge in the middle of all that! I WONDER WHAT COACH MANHUE HAS TO SAY ABUOT THIS MIHSAP?!!!!! OR MAYBE COUCH TILLY AND TEH WALL?! !